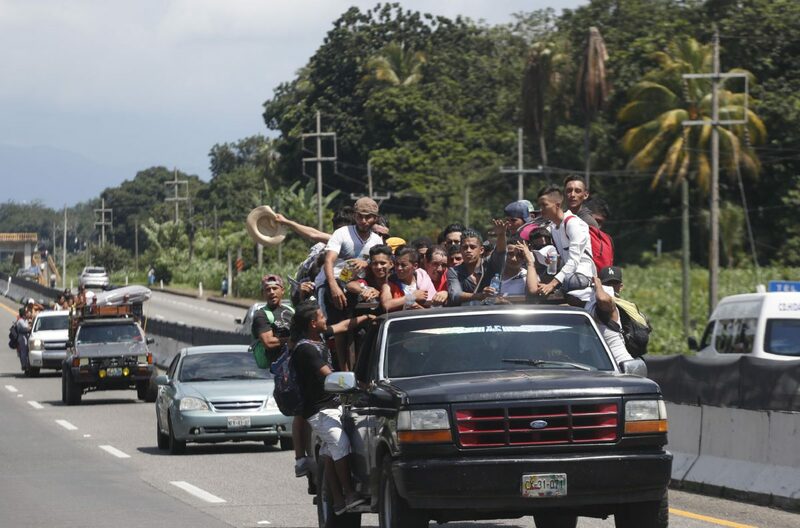 Central American migrants making their way to the U.S. in a large caravan fill the truck of a driver who offered them the free ride, as they arrive to Tapachula, Mexico, Sunday, Oct. 21, 2018. Despite Mexican efforts to stop them at the Guatemala-Mexico border, about 5,000 Central American migrants resumed their advance toward the U.S. border Sunday in southern Mexico. President Trump’s deployment of active military troops to the U.S.-Mexico border might alarm some people, but those people probably don’t live in the Rio Grande Valley. The actual placement of the troops hasn’t been disclosed, but since some previous waves of migrants have come to the Valley, a military presence here would not be a surprise. The Trump administration on Thursday announced plans to send at least 800 military personnel to the border in response to a caravan of Central American refugees who are trekking north through Mexico. The migrants are mostly on foot and are expected to begin arriving at our border in early December. The group at one time numbered up to 7,000, but high attrition rates caused by illness, exhaustion or lost motivation will reduce that number considerably. Federal officials say the troops should arrive by Oct. 31. Apparently, people already see the deployment for what it is: an effort to scare the migrants away, and to scare conservative voters to the polls on Nov. 6. Trump has promised economic sanctions against Honduras and El Salvador, from which most of the migrants departed, if the countries don’t forcibly restrict their citizens’ movements, and against Mexico if it doesn’t push the migrants back to their home countries. Mexico has replied that it will observe its own immigration laws, and President-elect Andres Lopez-Obrador has said he will try to accommodate valid asylum seekers after he takes office Dec. 1. Most Valley residents likely liken this military call-up to previous deployments of National Guard troops — in fact, some 2,000 Guardsmen currently are working the border and another 2,000 are budgeted to join them. Like the Guard, the military will serve strictly supportive roles; helping Border Patrol with surveillance and building infrastructure. They mostly will work behind the scenes, not directly with immigrants. Federal law prohibits the use of active military troops from performing law enforcement duties in this country. The need for such a ban was seen in 1997 when a teenaged goat herder was fatally shot near El Paso by a Marine who was assisting in a drug-interdiction operation. Military troops are trained to engage an enemy — they “kill people and break things,” as the popular saying goes. Border police actions are complicated; officers do engage drug smugglers and other criminals, but they also have the humanitarian job of assisting harmless immigrants, many of them refugees. And they need to know the difference. This requires specialized training. We trust that any troops who come to the Valley will find what their Guard predecessors discovered: a relatively safe, welcoming area that isn’t a war zone, but merely a backdrop for federal officials’ bluster and saber rattling.